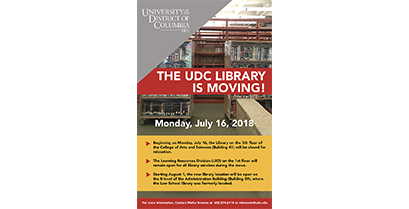 Beginning today Monday, July 16, the University Library on the 5th floor of the College of Arts and Sciences (Building 41) will be closed for relocation. The Learning Resources Division (LRD) on the 1st floor will remain open for all library services during the move. Starting August 1, the new library location will be open on the B-level of the Administration Building (Building 39), where the Law School Library was formerly located. LRD is comprised of the Library Services and the Center for the Advancement of Learning (CAL).